Spring is finally in full swing! Depending on where you live, maybe it doesn't quite feel like spring yet—better yet, maybe it already feels like summer where you are. 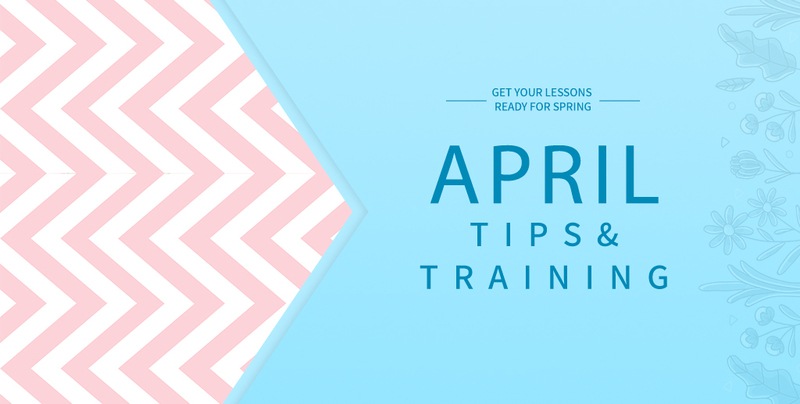 Regardless of the weather outside, spring is a great time for dusting off old lessons as well as creating new ones. Great Games Pack: Preparing students for tests or just checking for understanding has never been more fun and engaging thanks to this lesson pack. Simply add your own questions and start playing! April Calendar and Morning Meeting: This calendar and morning meeting pack will help you start each day on a bright, sunny note! Students can practice skills using the featured calendars, morning meeting activities, attendance chart, daily graphing activity, math activities, and more. Lesson Renovation | Earth Day: Join us in celebrating our amazing planet Earth! In this interactive lesson series, K-6 students can explore recycling, water conservation, and energy conservation. For 7–12 graders, you can take a more in-depth look at renewable and non-renewable energy sources. Renovated | Contraction Action: Understanding contractions is made fun and easy for your students thanks to this recently renovated lesson. Spring Gallery Pack: This gallery pack is filled with images, templates, and lessons/activities to get you started and hopefully bring some springtime fun to your classroom! If you enjoyed the above content, consider joining MimioConnect™, our interactive teaching community, to access more of our valuable lesson content and resources. Click here to register today! Mobile devices continue to be a popular option for schools thanks to their low cost of ownership and ease of use to make learning more engaging. There are various platforms to fit the needs and preferences of schools, whether it be Chromebooks, tablets, or iPads. Implementing a bring your own device (BYOD) model in a school—allowing students to use whatever technology they already have—is also an option many have embraced. The power of the mobile device isn’t necessarily the device itself, but how it is used in the educational space. With the MimioMobile™ collaboration app, you can integrate virtually any device you have in a classroom to bring out the true learning potential of the device. It makes no difference what platform of mobile device, Chromebook, or even computer you have implemented already, MimioMobile brings a variety of options to life. Using MimioMobile, you can deploy true collaborative lessons to each student device, where all students are able to work on an interactive lesson and collaborate with each other with the front-of-the room display. Student devices are able to be given one-to-one control by the teacher, as well as full control of the teacher computer in order to present a lesson or accomplish a task. A third powerful feature comes in the form of assessment. Who knew that the mobile devices you already own have built-in assessment capabilities that include multiple choice, true-false, as well as short answer and essay answer options? Using MimioMobile, you can bring out the real power and easily integrate your devices through simple-to-conduct assessments, giving you real-time feedback from your students. There are also a number of powerful teacher administrative controls at your fingertips, such as being able to freeze all device screens and on-screen indicators when students are not engaged in the application. If you are currently a Mimio user, you already have the ability to use up to three devices in your classroom with full access to MimioMobile for free. If you want every student in your classroom to have access, you’ll need to purchase an inexpensive yearly license that opens up so many learning opportunities, you’ll wonder what you did before learning about MimioMobile. Plus, Boxlight offers a number of training resources to help you learn more about all of their products and software, including MimioMobile. Register for our upcoming “Mimio Goes Mobile” Quick Learn session, offered on April 8 at 7:00pm, to learn more about integrating mobile devices in your classroom. The drawing and highlighting tools within MimioStudio™ classroom software make it so easy to get started with becoming interactive in your classroom. If you are new to using a Boxlight interactive product such as the MimioTeach™ interactive whiteboard, MimioPad™ wireless pen tablet, or even using MimioMobile on your own teacher device, the pen, highlighter, and eraser tools provide the basics for adding more powerful tools to your teaching toolbox. Simply being able to digitally write on your interactive whiteboard class notes or example algebra problems provides you with instructional options. You may draw diagrams to show complex topics in a science classroom such as orbital notation, or even digitally highlight passages of a text that a language arts class is reading. The great thing is that you can click to save everything, which is then digitally captured to continue working on the next class period, print out the file for students to take with them, or even post the digital notes on your classroom website. MimioStudio has many great and powerful tools that you can learn to fully integrate into any lesson. However, sometimes we overlook the simplicity of using basic tools to have a very meaningful learning opportunity. I encourage you to explore the simple side of MimioStudio with these basic, but most effective, tools. You’ll even have options from colors to stroke width, adding even more dimension! Learn more in our upcoming “Tour of MimioStudio” Quick Learn sessions, offered on April 2 at 7:00pm and April 17 at 8:00pm. Interested in checking out more of the Quick Learn sessions offered this month? Click here to view our complete list!